Your fireplace is likely the center focal point of the room it’s in. Whether it’s wood-burning, gas or electric, your fireplace is designed to be enjoyed even while not in use. There are a lot of ways you can go with fireplace design and for homes undergoing any remodeling, it’ll be an essential point of focus. 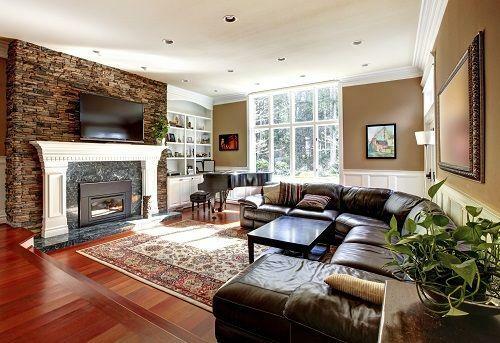 With old units largely consisting of a mix of red brick or overdone face designs of flowing floral accents, there’s generally room for improvement for the untouched fireplace. Here are three fireplace designs that might help you plan or inspire your build. Now, there’s a reason why you typically only see firepits outdoors: They’re dangerous if don’t wrong. Ventilation is critical for safety. For most existing homes, a fire pit inside the house is impractical. The infrastructure for adequate ventilation needs to be there to ensure the fire (wood, gas or electric) can burn safely. But that doesn’t mean it can’t be done. All indoor fire pit plans must begin with an intelligent plan for ventilation. Because more than it’s just a fireplace, an indoor firepit is an exhaust system disguised as a fireplace. When designing or building an indoor firepit, the heat should almost be thought of us a pleasant side-effect of the ventilation system in your home. The main goal is to make them as contained as possible. While there are options for creating a more authentic, “open” firepit that works indoors, insurance costs and general safety requirements mean the best bet is to go for something as close to a sealed traditional fireplace as possible. 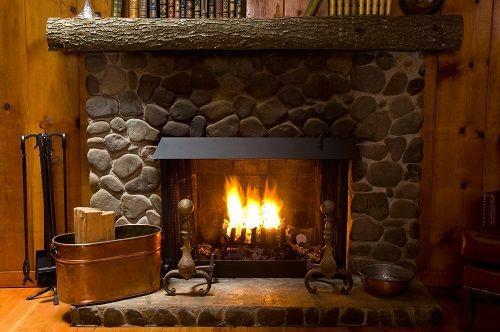 That would mean that the hood of the fireplace is situated almost immediately on top of the fire to and there is some protection from embers that wander into your living room as they crackle and pop. 1) The design described above would be pretty close to a wood-burning stove, except it’s less efficient. 2) That sounds like it’s mostly for show that it is for function. Throughout just about everywhere in the world, there is a tried-and-true design of fireplace. Most of have seen them, if not grown up with them in our homes. The reason they’re so popular is because they’re safe, they look right at home and most of all – they work. People got fireplaces right a long time ago. The thing that makes traditional stone fireplaces desirable is that they’re designed to capture and remit heat into the room. They do these because brick or other stone tends to hold onto heat for a while. In fact, bricks can provide heat for as long as 24 hours after the fire was lit. 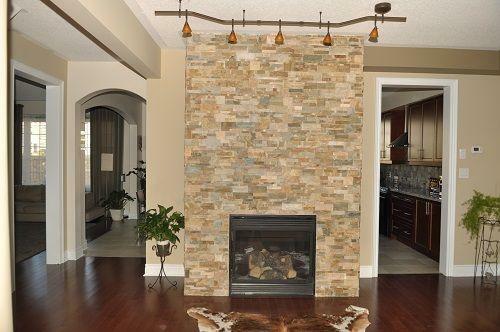 Modernized designs may look great, but few deliver the level of heating that a classic stone fireplace can. For those fireplaces characteristic of homes throughout America, there are some easy upgrades that can be done to match their utility with the comfort of your home. Most fireplaces can be fitted with internal mechanisms that make it easier to keep the smoke out and the warmth in. Automatic dampers can ensure that smoke never drafts back into your home by making sure the line is open. These dampers are thermostat controlled and open up all by themselves. The reason these are helpful is that failure to open the damper is a common cause of smoke entering – and damaging – the interior. Double-walled flueThe flue is what allows your fireplace to breathe out the smoke (and heat) that it produces. While their function is pretty simple, newer flues tend to be safer by using double-walled and insulated. In general, they also tend to provide a more consistent flow up and out of the house than older flues. While stylistic updates to the mantel and face of a fireplace can always be done, there are functional retrofits worth doing for some of the old fireplaces out there. We’ll go into more detail on modernizing your fireplace below. Like the backsplash to your sink, the wall behind your fireplace is ideal for impactful design or accents that work with the rest of the room. The most common choice for a fireplace is typically some kind of stonework or brick, held together by a heat-resistant mortar. The reason for that is, as mentioned above, the superior and more efficient heating potential. But the mosaic doesn’t need to end at the fireplace and can extend to cover most, if not all of a wall. For home looking to make a statement with their fireplace’s design while keeping to the signature characteristics and utility of the traditional style, a modern mosaic is an easy option. Wood or Non-Wood: What Kind of Fireplace Is Best? For any style of fireplace, there’s a choice between wood and non-wood burning stoves. Both have their appeal and both come with downsides that should factor into any design decisions. Let’s take a look at wood first. Wood is what started it all. Fireplaces were designed both functionally and aesthetically to make burning wood inside the house safe, easy and pleasant. With the surplus of available wood in the Portland area combined with plenty of wet, cold nights, it’s not surprising that wood-burning fireplaces are a common request for us. There’s nothing quite like the sound of real wood crackling. Not to mention the process of watching a fire come and go is often the perfect way to spend an evening at home. The experience of tending to a fire, making sure it’s just right and enjoying your work are just things that some people have to have from their fireplace. The downside of a wood-burning fireplace is that they may be less efficient than other options. Done wrong, burning wood could lead to smoke going into the home, and there is always the issue of keeping your chimney clean. For non-wood fireplaces these days, people can choose from electric, bio-ethanol or gas. To keep things simple, we’ll look at what gas fireplaces as they’re the most common alternative to wood. Gas fireplaces are appealing for two reasons: they tend to be more affordable and they’re a lot easier to deal with. Because much of a wood-burning fireplace’s construction is built to keep smoke from wafting back in the home, gas fireplaces require lighter building overall, which decreases price. For even greater incentive, they’re incredibly easy to deal with. Instead of gathering wood, tending to the fire and keeping it going, gas fireplaces only require a line with fuel, and the press of a button. Whether you want a natural fireplace or a gas alternative, hopefully this helps make the decision a little bit easier. The main thing to remember is that a qualified builder can incorporate aspects of both, and can install the perfect setup to keep your home warm.